Call Metropolitan Community College & Iowa Western Community College to sign up for their classes. Note: MCC classes are held at Millard South High School (MSH) or DoSpace. IWCC classes are held on campus in Council Bluffs, Iowa. I am available for hire to teach at your next MOPS, business or church meeting. 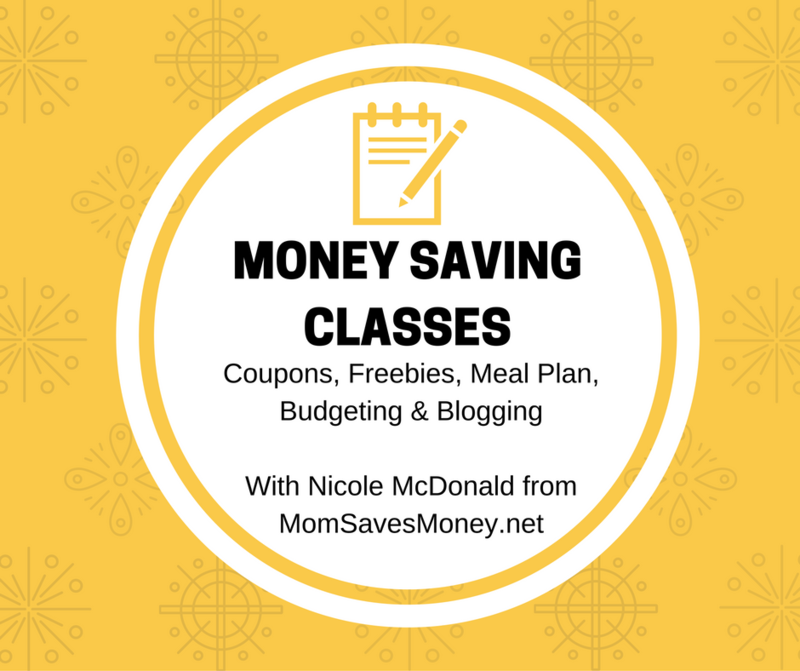 I teach Coupons, Advanced Coupons, Freebie Frenzy, Successful Meal Planning, Budgeting, Apps that Pay, Pinterest for Business, Blogging for Beginners, Blogging for Profit, Slow Cooker Freezer Meals, Instant Pot Cooking Basics, and Frugal Family Fun. Each class is two hours in length. One-hour Introduction to Couponing class also available. I will have discounted Omaha World-Herald newspaper subscriptions available to purchase at every class. Home Parties available. Host(ess) gets a basket of goodies and free class with eight or more paying friends in attendance. 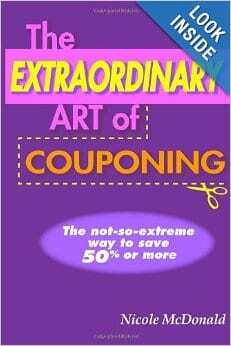 Host(ess) will receive a free autographed copy of my book ‘The Extraordinary Art of Couponing’ with 12+ guests. Minimum eight guests required for home party class. Email nicole (at) momsavesmoney (dot) net or click ‘contact’ at the top of the site for more information about classes. How do we get into one of your classes? If the classes are at Metropolitan Community College or Iowa Western, just call the colleges to register for the class. If the class is at a public library, simply pre-register with that particular library. I am also hired to teach at home parties and for organizations. Those are generally by invite only. Sure. You can just show up for the class. It starts at 6pm and in the past classes at Bellevue library fill up fast, so I recommend coming a little early to get a good seat. 🙂 See you then! I’d like to register for your classes this week, especially the Freebies class at the South Omaha Library? What Metro Community College location is your class held at? I would love to host a class! Would you please give me some more details!? Can I get a little info on hosting a class? Hi Nicole! How much do you charge to do a private home lesson I a group of friends? And do you cover only one topic….ie JUST coupons or JUST meal planning or can we combine those two topics? Hi! I emailed you the information. I would like info on hosting a class for beginners please! I love in council bluffs!! I would like to get some information about classes and options. Possibly home classes. Thanks! Please send me the information on hosting a private class. Thanks! I chair a team at my church for outreach to the community. I would like to teach the team about couponing so we can help more people for less money. What would you charge to teach the class or when/where is your next class we can attend? Hi Lory! I emailed you information. Could you send me information on hosting one of your classes in my home? Thanks! When are you having a class at Iowa Western College? How much for a home class? Nicole can you email me with information on how to register for a class a few friends of mine and I would love to register! Nicole, I am very out of practice with couponing since I haven’t done any in almost a year. On top of that I am JUST now moving to Omaha in fact I won’t be there until the first week of august. Can you help me get back on track and help me find a good way to get all my coupons without breaking the bank? Which Metro are the classes at? would like to join one of your bellevue cpn classes for a home showing if anyone needs extra people. I was wondering if anything was open on the August 6th class? For the August 6th class, which Metro do we have to call to pre-register? Can you please send me some info on hosting a class. Thanks! I live in Syracuse, NE. I may have a group of ladies that would like to have a class on couponing. Any information would be appreciated. Thank you. How do I go to this class and learn? I think this class is full. Attending a home party is up to the hostess since they are usually held at a person’s home. Thanks! Do you have any upcoming parties in the Papillion area? I’d love to attend one. Thanks. It is up to the individual hostess to invite others and currently have none in the Papillion area. I do teach the Metro classes at Millard South high school and have a coupon class on Wednesday if you are interested. Interested in possibly hosting a coupon for beginners class at our church. What information do you have about hosting a class? Hi Kim! I emailed you! Nicole, I am interested in taking your class on Wednesday. How would I go about getting signed up for it? I just read the other comments and my questions was answered. I will contact metro to register. It’s best if you take coupons first. I go over how to organize your coupons, plan a trip using coupons, how to shop CVS & Walgreens and where to find coupons. Advanced couponing is more store specific. I teach how to shop Target, Baker’s, Kmart, double coupon events and how to save on Fuel. I also teach how to use various coupon apps and more suggestions for ways to find coupons. Hope that helps. Can you email me the information on having in-home classes offer what? Please and thank you. What street is the Metro on that you teach classes at? Most of my MCC classes are held at Millard South High school. Can you send me details on possibly hosting a class? Please and thank you! I’m trying to sign myself, my mom and sister up for your 10/21 Fremont Free class. Can you add us to the list? The link on Facebook isn’t taking me anywhere to sign up for the class. Any of them would be beneficial to save money. I would recommend starting with coupons and meal planning if your focus is saving $ on groceries. Freebies is a good class to help you learn how to get free toys, gift cards, electronics, meals and much more. Are you doing any meal planning classes at an Omaha library? Hi Tricia! I don’t have any currently scheduled with the libraries. Can you provide me with information on hosting a private class? Can I please get more detailed information about your classes??? Hi Christina! The Metro classes are held at Millard South high school and Iowa Western classes are on their campus in CB. The home parties are by invite only since they are typically held in someone’s home. The library classes are held at that branch listed and Fremont classes are held at Fremont First State bank and trust. Hi – could you please e-mail me with information about your classes? I was able to look online at Metro, but not sure when the last day to register for the March 11th class? Also – what is the process for hosting a class? Their numbers To register by phone are 402-457-5231 or 800-228-9553. If you have an MCC account you can register online as well. I would also like to have more information about your classes. Can you please email me the information? Thanks. I sent you an email Dorothi! Mia, I’m in Bellevue too. I believe I could come up with an additional 3 maybe 4 that would/could attend the class with you. Hi. I’m in Bellevue also and I’d love to attend. Is there a way to register for the May 4th class at the Carter Lake Resource Center? Yes. contact the carter lake resource center or check out this facebook event. Hi Nicole, Im interested in hosting a class, could you please email me info? Thank you! Most classes are 2 hours. I also offer coupons, meal planning and budgeting as a 1 hour class by special request. Nicole we would like to talk to you about an advanced class. Please send us information and a way to contact you. Send me direct link do i can send you my phone number directly. Augs 12th class what metro college is it at south or north? Also the coupon classes what does it teach you? I teach the Metro classes at Millard South High School. The coupon classes includes getting organized, where to find coupons, how to use coupons, pricematching and how to shop Walgreens & CVS. Lots of information in two hours. Hope to see in a class you soon! How much is your class and how much is it for a pru ate party of about 10 ladies.thank you first time couponer. Can I get info on hosting a class? Fees, etc. How much to attend a coupon class at the libraries? And is that class your basic couponing class and do we need to bring anything? The library classes are no charge. No need to bring anything. I will have all the materials needed for the class. I am a beginner but if I wanted to host a party what would I have to do? And what is the cost? Hi Francine! Thank you for asking. A home party is $10/person with 8 person minimum. Host is free with at least 8 guests and gets a free copy of my book with 12+. All hosts get a goodie baskets with coupons and fun items. Feel free to contact me to book a party. I’m interested in hosting a party but would like to know how much each guest would need to pay so I can gauge interest on FB. Can we just drop in or do you have to register? You will need to register for the classes. For the colleges, just call the registration office. are the classes at metro free? No, they are regular non-credit class prices, so $19 for a two-hour class. I am in New York and teach adult ed classes similar to yours. Do you have any pdf resources you can share with me for my classes on freebies and sweepstakes? No, I’m sorry. I created each of my classes from personal experience and the material is protected. Thank you! Hi, I am looking for info on yiur.class at Millard South on coupon ingredients. Also, private party in my home pricing. I would like to sign up for the couponing class but I’m confused as to what number to call to sign up? Nicole-I would like to do some of these classes but I don’t understand where to sign up for them and if the mcc ones are held there are elsewhere. I apologize again for not understanding this stuff and bothering you. Please help this technically challenged women. I also was wondering how I get your book. This term my classes are either held at Millard South High school or DoSpace. You can also call MCC and register via phone if that’s easier for you. My book is available in print or as ebook on Amazon. Those classes will be held at DoSpace on 72nd and Dodge. I do not have a Spanish class available at this time. Hi Nicole! When and where is your next couponing class? ?